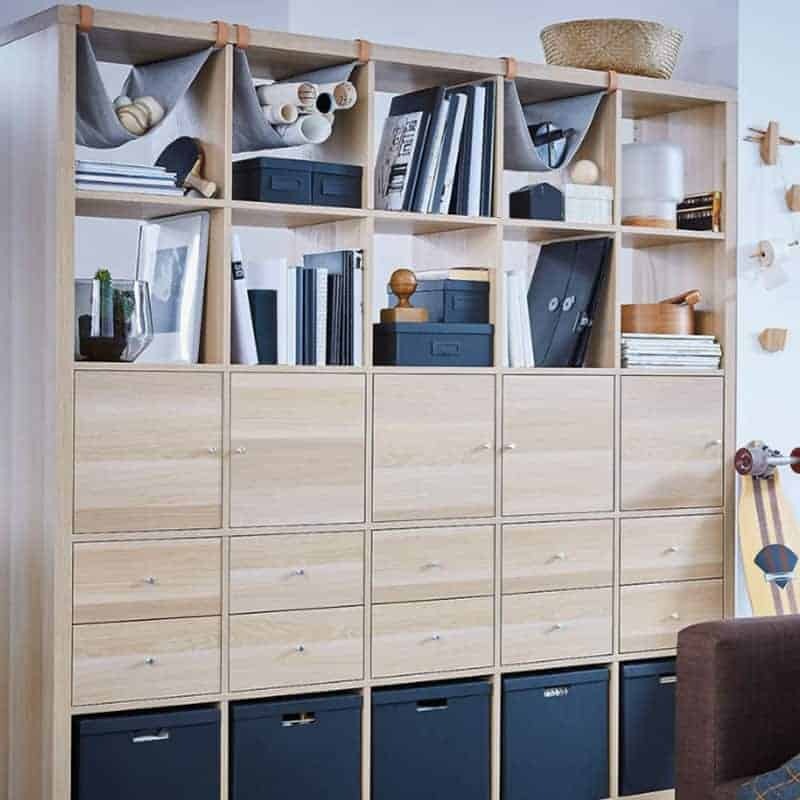 One of Ikea’s most popular furniture items has always been the Kallax bookshelves, or as you may otherwise know them, the Expedit bookshelf. This versatile cube shelving storage unit comes in multiple sizes and colours to fit practically any living space. 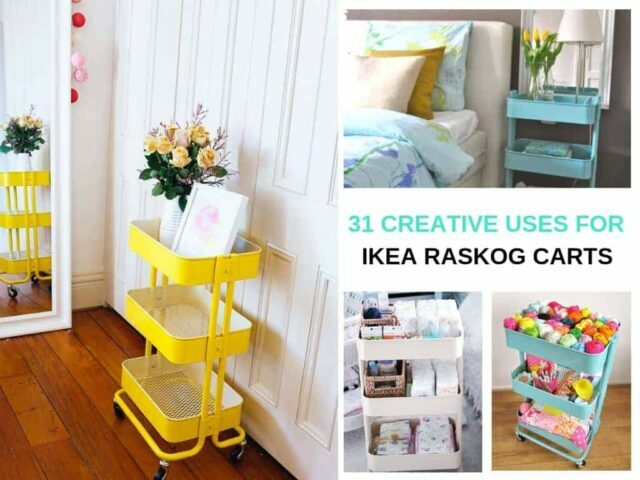 You will find Ikea Kallax inspiration for every room of your house, and hacks to create a whole heap of new uses too! It can be challenging to find suitable storage solutions to suit your home, whether it be colour scheme, style or space restrictions. This is what makes the Kallax so great. The Kallax is my personal favourite Ikea product, closely followed by the functional and mobile Raskog cart! 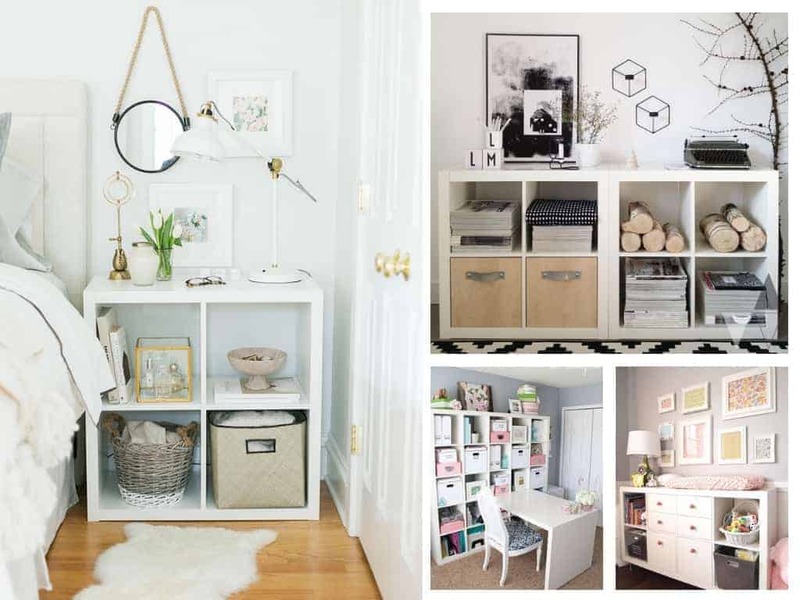 Simply popping a Kallax unit into your house looks simple and functional, however these Ikea Kallax hacks and inspiration will help you find the perfect idea for every room of your house! From kids rooms to craft rooms, bedrooms to bathrooms, we’ve got the works! Before we kick off checking out all these glorious Kallax hacks and styling ideas, let me just talk about the unit itself. You can purchase the different sized Kallax units in store at Ikea, or you can can purchase them online via Ikea or Amazon. You may also hear these cube style units referred to as Expedit, which is the previous model cube shelf made famous by Ikea over the years. The dimensions of the Kallax are almost identical to the Expedit, with the exception of the trimming down the external frame slightly, in an effort to be more sustainable. So this is a positive thing! And we still get a unit to love and use all around our home! Right… now let’s get on with the exciting stuff and be ready to be inspired! The best thing about Ikea furniture is that most items work well just as decoration pieces in your home, but with the added bonus of providing storage solutions too. I love this simple display shelf set up using two 2×2 Kallax units. If you have a open plan living area, or live in an apartment, you may want a solution for creating more privacy or separation between rooms so a Kallax room divider is a great option. You will want to use inserts that are either functional or look great from both sides, however there are loads of Kallax inserts and drawers that will work perfectly for this. 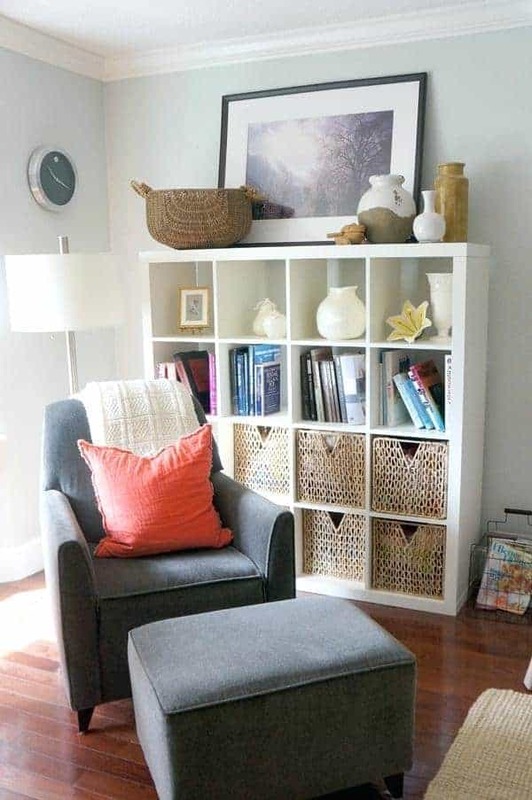 Keeping it simple with this use of the Kallax 4×4 unit, with storage baskets, a bookshelf row and a display row. This is both functional and decorative for the living room area. Find more details on this one here. 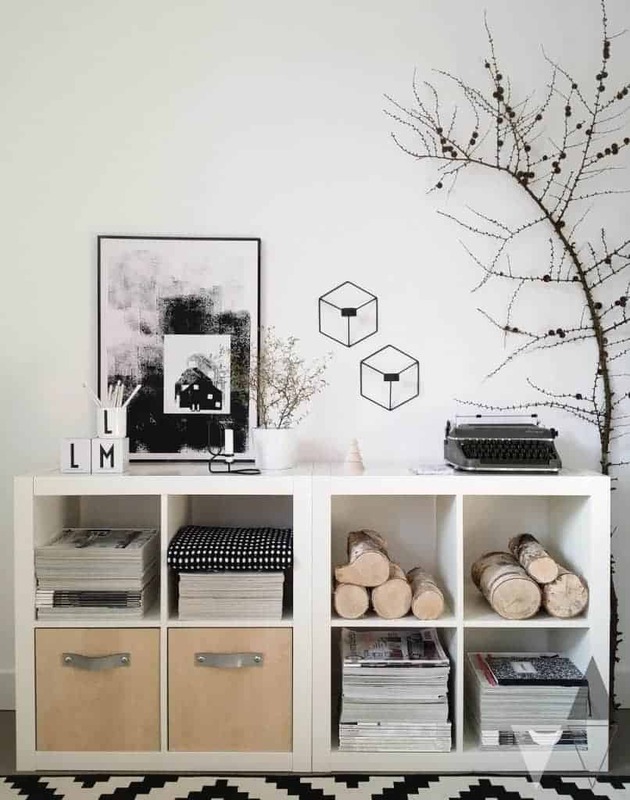 This is another simple by stylish home decor idea using the Kallax 8 cube bookshelves. You could display your favourite books or travel memorabilia or ornaments. Anything really. 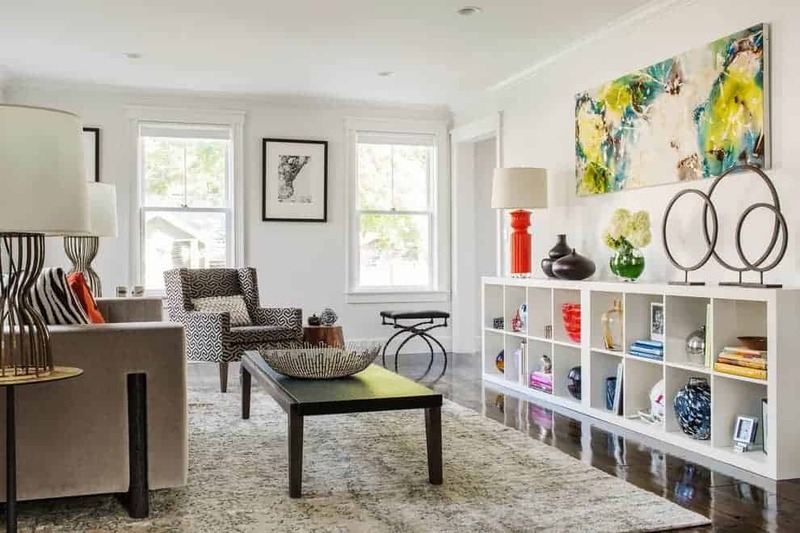 The squares are large enough to fit quite a lot in each one and I love the modern home decor on top in this beautiful living room inspiration. I’m a big fan of toy storage ideas and this one is a perfect example of functional toy storage that also hides everything away. This means a beautiful tidy space where everything has its own home. 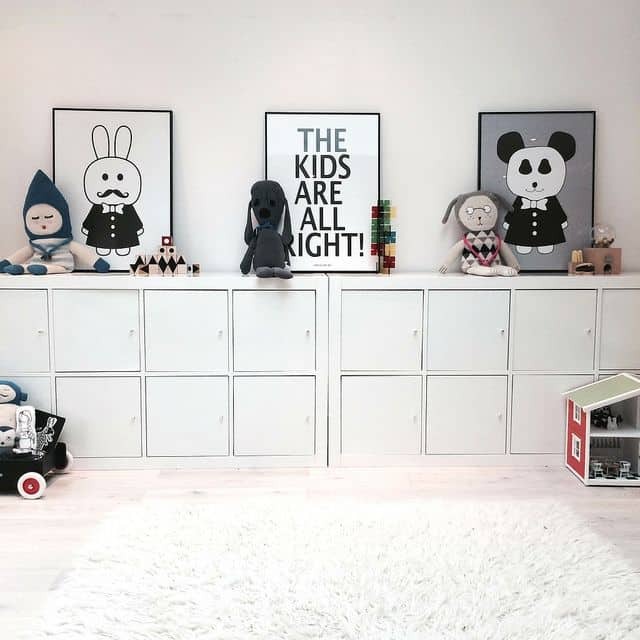 My goal is to set up our own toy room with the 2×4 Kallax bookshelves this year, so I could not love this more. In fact, the whole kids bedroom design is beautiful. Check it out here. You can get this same look using the Kallax door inserts. 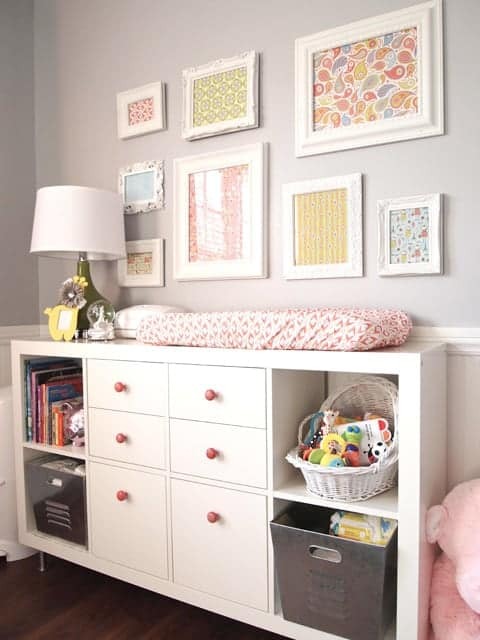 What a brilliant way to keep costs down by turning a Kallax bookshelf into a change table for your nursery. You can create your own foam changing mat or purchase one to pop on top. This is a huge saving rather than purchasing a stand alone baby changing table that you will only use for a year or two. And the cube inserts with the drawers and cupboard doors look fantastic for hiding away baby essentials in easy reach. Why should the adults have all the fun when you can convert your Kallax shelf into a shop for the kids playroom. 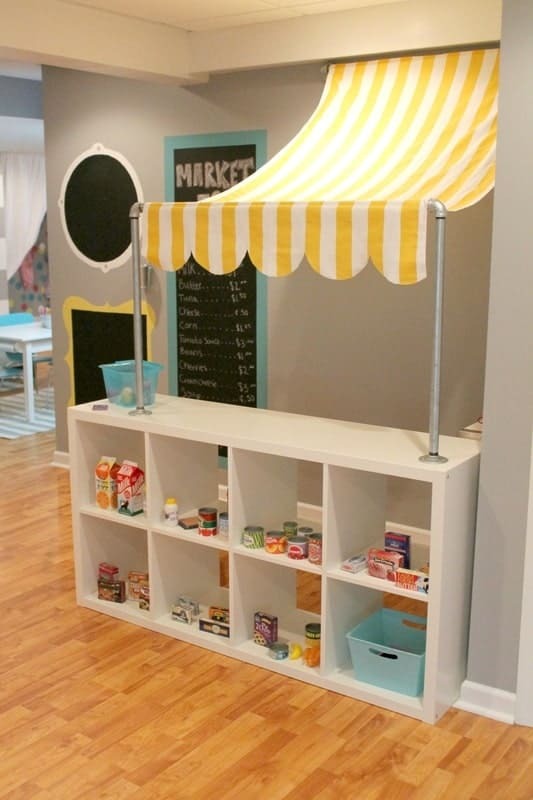 This is such a cute Ikea hack and also a great way to promote pretend play, imagination and teach simple numeracy skills through their shop sales and purchases. Their friends will love to come play too! They have loads of other fun kids spaces room inspiration here too. This is an alternative idea for the Kallax shopfront for playrooms and a little simpler since there are no modifications needed. 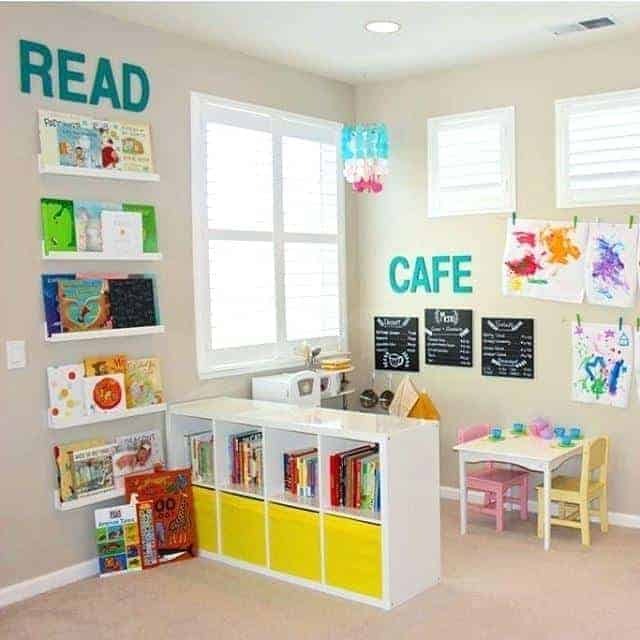 However it is a great way to set up a play corner for the kids with the cafe style shop front, plus a reading nook all in one. It would work really well in a classroom for kindergarten or junior primary school or in a bedroom. Functional storage is a winner no matter what and I love seeing all the Kallax units converted into bench seats for playrooms or bedrooms. 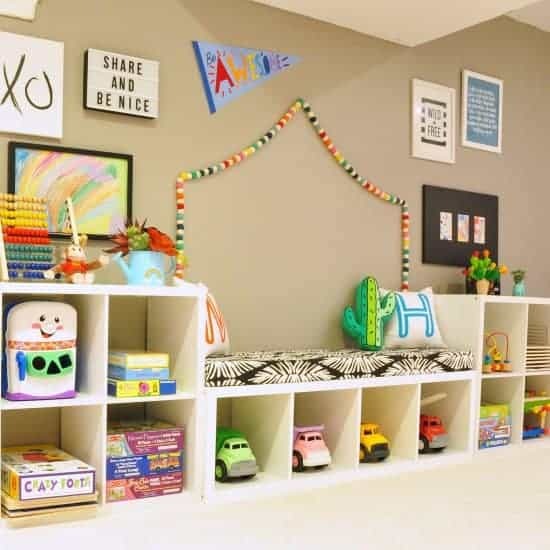 This is a great way to create a comfortable playing space for your children, while also having a place for all their toys too! Find the tutorial for these bench seat cushions here and check out the rest of this gorgeous looking playroom. 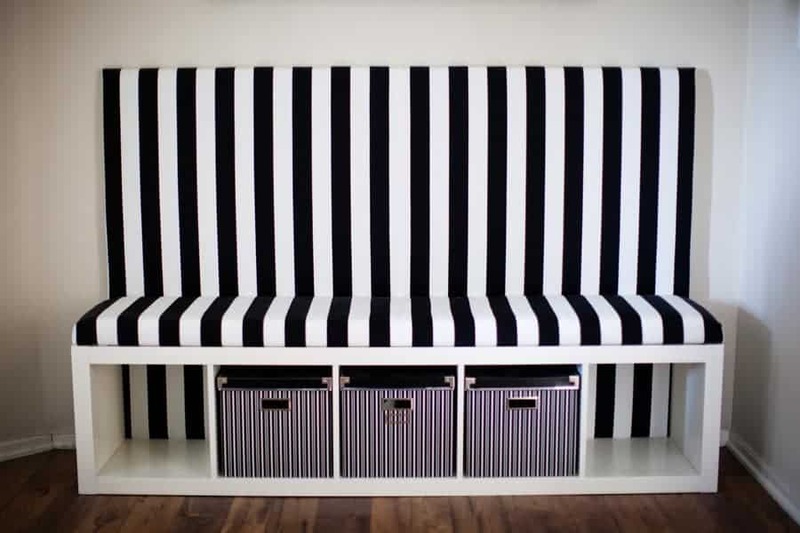 Like I said, I love the look of these and the idea and this one is a great tutorial also with making Ikea Kallax bench seat cushions, only these ones are no sew! I love how they have put the two 2×2 units at either end for extra storage too because it creates such a cute little comfy nook in the middle for kids to lay back and read a book or chill with their technology… yeah hate it as we do, it happens sometimes! The Kallax 2×2 unit is a great alternative for a bedside table. Not only does it deter accumulating clutter (this is one of my worst clutter spots), but it is also a cute way to set up some extra home decor in the bedroom too in each of the 4 squares. You could set one of the sections up as a charging station, perhaps with a stylish looking charging pad. A perfect space for a clock, your current book and maybe a plant! This room is loaded with Kallax bookshelves, against the walls and built into the bed. There is no tutorial on how to make the bed, however it would not be too difficult to build a couple of shelves into a bed frame for under bed storage. 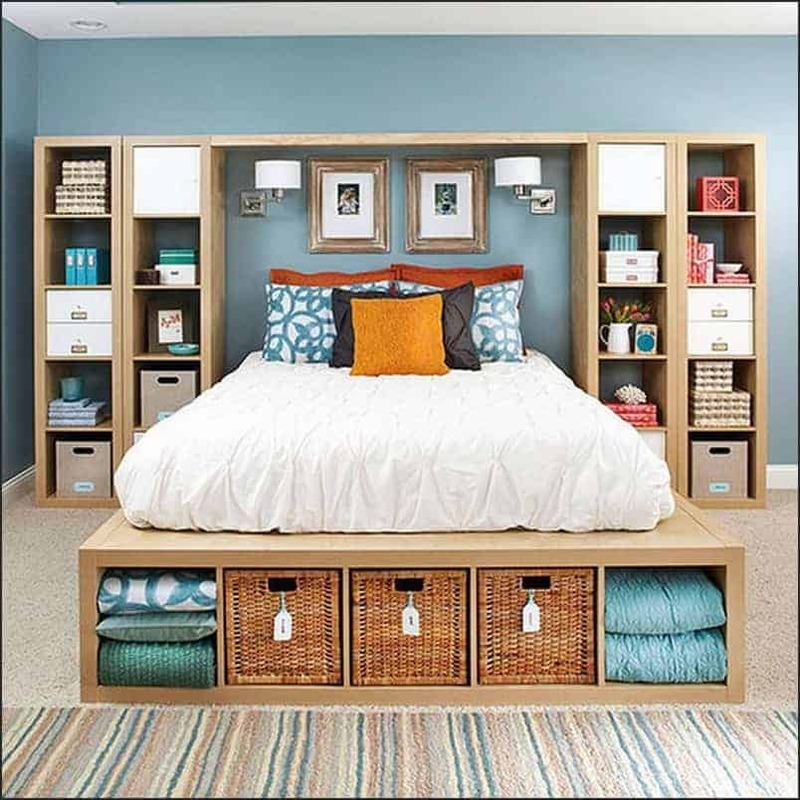 I love the idea of storing extra bedding or perhaps even seasonal clothing in those under bed boxes. Check it out here. 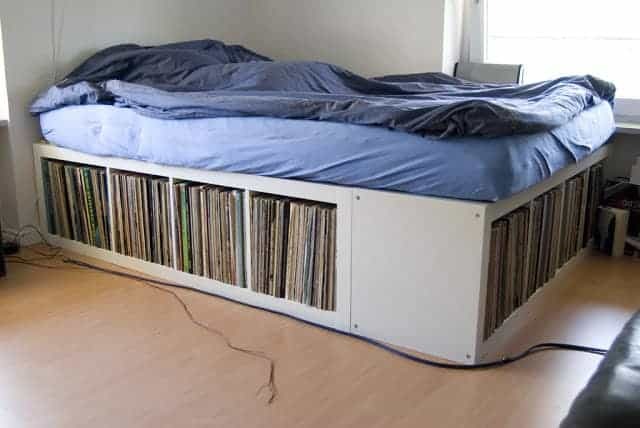 This tutorial shows you how to use the Kallax units to make a storage bed, with the goal in mind of providing storage for vinyl records, however pop in some inserts and boxes instead and you can have storage for anything under your new storage bed! How incredible does this hacked Kallax unit look! 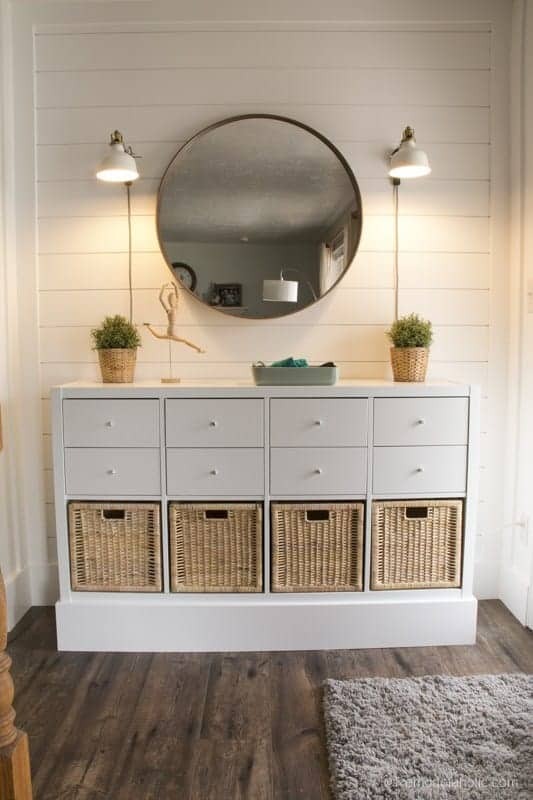 This was created as an entryway unit, however it would be a perfect dresser or storage option for the bedroom or bathroom, or any part of the house really! You can find the details on their blog post here My favourite part of this hack is the casing around the base. They have raised it up but also given it a solid streamlined look by adding this over the legs. It completely changes the look and makes it a really stylish piece of furniture to have on display in the home. 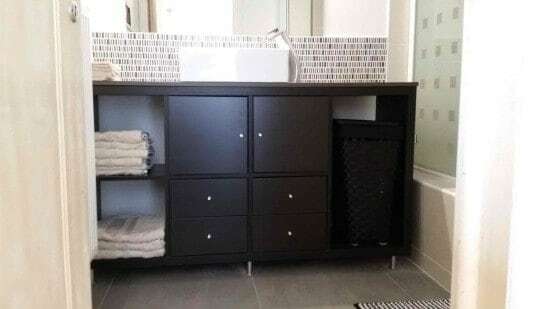 If you are looking for a unique bathroom vanity idea, this Kallax hack is quite detailed in how they converted their shelf unit into a sink vanity unit. This is a huge DIY project and not as simple as most of the ones featured in this post, however it looks amazing and it’s a really cool idea too so I wanted to include it. You may need to call in a professional to help out with this one if you don’t have any building and plumbing experts in the family! This is a super simple way of using your Kallax bookshelf of any size, as a way of incorporating extra storage into your bathroom area. 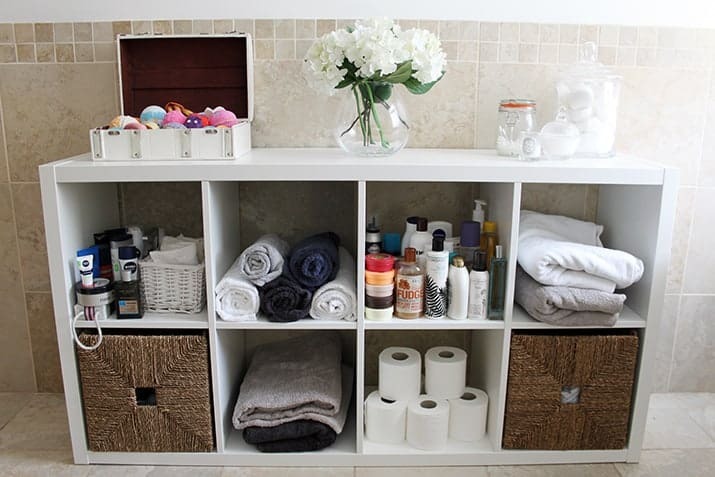 This would look great with a few extra baskets or drawer inserts to hide the toiletries from display, but overall it is a cute bathroom storage solution. Check out the rest of the post here. 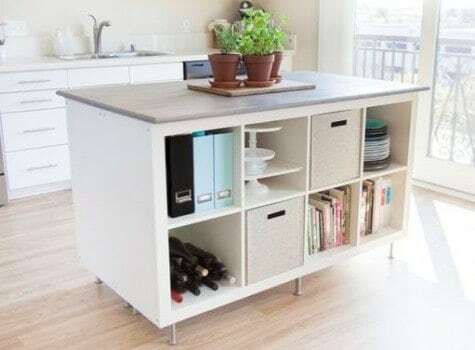 If you add legs to Kallax shelf, you can change the look completely, like with this DIY kitchen island hack that is raised up from the ground to give it better height for use in the kitchen. The 2×4 Kallax is not quite high enough on it’s own. In this kitchen island hack, they have used 2 of the units back to back and added a bench top for use in the kitchen. A great option if you are limited on bench space and want some extra bench top to use while you are cooking! Hacking like a boss over here with this super cool kitchen island idea! Check out the tutorial here and see how you can create your own 2×2 Kallax kitchen island on wheels. They have used the cupboard door inserts for the Kallax to give it some hidden storage, and minimise stuff falling out if you are rolling your cart around too. It looks great! This DIY bar cart Kallax hack is as easy as adding Kallax wheels and turning your 2×2 unit into a rolling cart. They have also added on a functional handle to each end on top so you can push your cart easily in either direction. This would be a perfect addition to your home if you love to entertain, or you could turn into a rolling craft cart instead. Either way, it’s a super fun and simple DIY project for your shelf unit. This was one of the very first things I added to my Pinterest boards all those many years ago when I started pinning my dream home and organisation ideas. It is such a simple Ikea hack too! It is essentially 3 5×1 Expedit units, which is the model before Kallax but essentially the same thing. Turn one on it’s side, add a chalkboard panel or some pain, and you’ve got yourself a simple and quick family command centre or extra kitchen storage and shopping list. 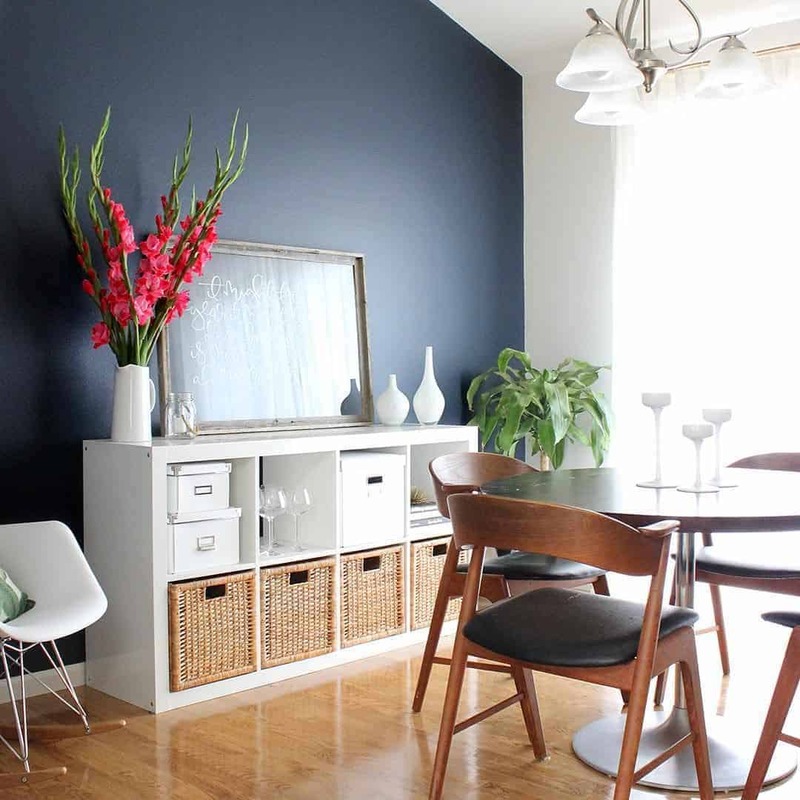 I love this Ikea hack because not only is it super funky, it is also really functional too, especially if you have a rather small dining room and you need to fit a dining table that takes up very little room. 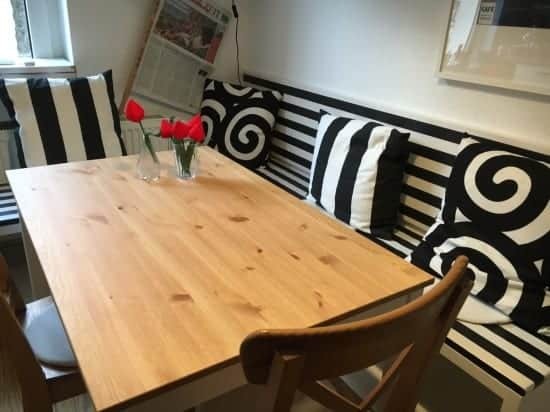 By installing your own DIY banquette seat, you can save space where you no longer need to worry about needing room for chairs to move in and out between the table and the wall. Instead pull the table to the seat! A great tiny apartment space saving idea, or it just looks cool too! This would also work as a hallway seat or in other areas of the home. This is a very similar project that again is a great space saver for small dining room spaces or combined kitchen dining areas. This kitchen corner seat has the Kallax 2×4 and 4×4 units built against the walls with cushions and headboards for a great little dining table space. Finding space with Kallax storage ideas is always a bonus so this simple look of adding extra storage space to the dining area looks great using a side facing 2×4 Kallax bookshelf. Find the original source on Instagram. I have been dreaming of a Kallax workstation for years and this Ikea Kallax desk is definitely joining my household soon! I love the fact that you have everything on hand right next to you as you work, with functional storage that looks great too! I love the floor to ceiling storage built into this one, using a Kallax 2×2 on top of a 2×4 Kallax bookshelf with the desk built in, plus an extra desk space along the side. Pretty much this is an office and workspace in one as you can roll around to work on projects. The extra space at the end is a nice bonus too. I love a workspace that is minimalist and everything in its place, mostly because mine never looks this great! The black and white office colour scheme looks great too, with the Ikea Kallax desk with chrome silver legs. The boxes are from the Ikea Tjena range which you can purchase online here. 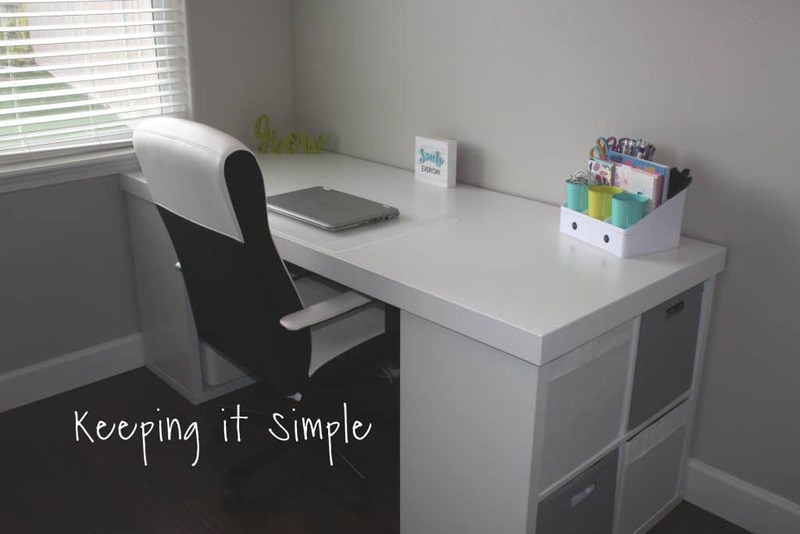 For a super simple Ikea desk hack, this one is great! You only need 2 Kallax 2×2 units and a benchtop to create your own DIY storage desk for a home office. This one can be put together in just a few minutes, aside from giving the glue time to dry. Find the tutorial here. The Kallax is the perfect storage solution for craft rooms and this was the very reason I got my first 4×4 Expedit unit back before they brought out the Kallax. It is a very stylish way to keep craft supplies organised, with the use of different inserts or simply using each square for a different type of craft supply. 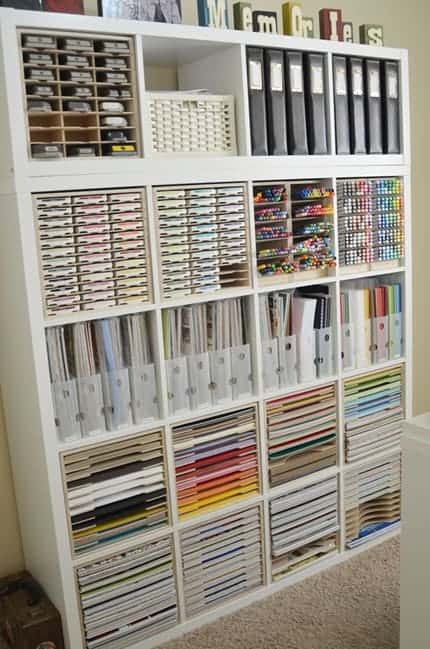 I love the look of this craft room storage, with all the perfectly fitted stamp pad inserts, paper shelving and pen dividers. This is pretty much a scrapbooking and paper crafting dream come true! 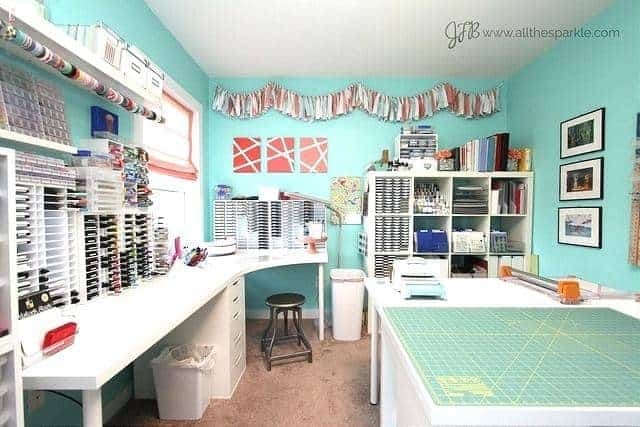 Major craft room envy right here! Check out more pics of this amazing room here. You can find all these different storage systems for the stamps and paper on the website too. This Ikea desk hack is perfection! Find the tutorial on how to make your own mobile workstation which is perfect for any craft room or man cave! This is such a great idea for a rolling sewing table, so you can move around to cut your fabric and pin. It would also work great for woodwork projects and similar handyman DIY projects. LOVE IT! 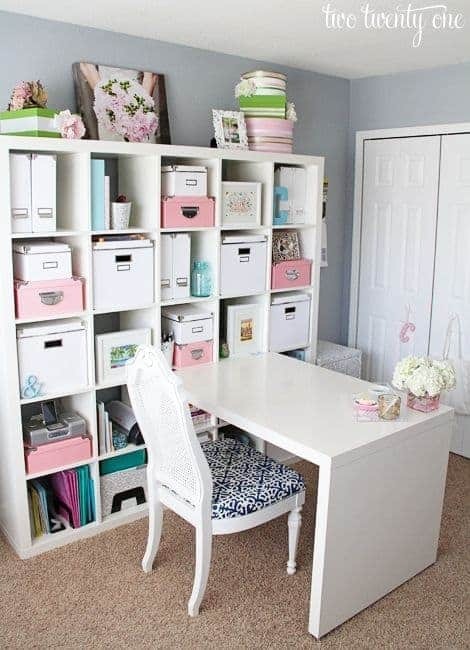 This is another beautiful home craft room inspiration that brings me envy. Loving those teal walls, but most of all, I adore the organised craft storage solutions they have installed. Of course the Kallax serves its function towards the back of the room holding stamp pads and also lots of different craft gadgets and tools. What a dreamy space this is! Are you already planning how you can deck your house out and pull together your first Ikea Kallax hack? Sometimes it is something as simple as a coat of paint to match your room decor, or leaving it perfectly plain and simple, embracing it as it is! You can find many of the products featured in this post, as well as loads more of my favourite home decor and organisation products here. Do you have a favourite Ikea product that you would love to see some inspiration for? Let me know in the comments!